Upgrading an Existing RIF without UKARA? Loadouts: ACU Digital Camo Vest/Helmet/Gloves/Scarf<br /> British S10 Gas Mask with Replaced Lenses. I'm guessing this is kind of toeing the line between whats legal and not legal under UKARA but I'm mainly looking for some clarity. 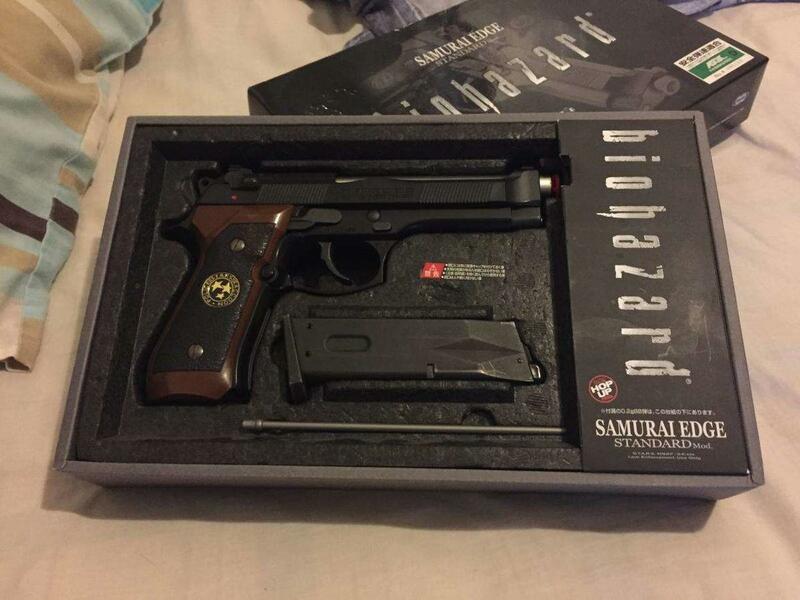 I got my Tokyo Marui M92F a long time ago, before UKARA, so could buy it as a RIF perfectly legally. However I've recently been getting into Airsoft and have taken the gun with me a couple of times to use on a local site (it's been through the chronograph and everything) but being over 10 years old and being mostly plastic, as most TMs are, it's a little worn out. I want to get a metal frame and slide to replace the existing plastic one, which I have sourced online, but the question is can I buy it without UKARA? or will it have to be painted? I am hoping as its not a full RIF and I'm not actually buying any working airsoft gun parts I'd be allowed to purchase this but the UK law isn't exactly forthcoming on what is and what isn't strictly legal. I've bought things such as springs and some internal workings before to replace parts that have broken and had no issues but seeing as this is a large part and something that could potentially change a coloured gun into a RIF I thought I'd better check. I'm in the process of registering for UKARA currently but with the minimum wait time it'll be sometime in September before its all done, and all that time without a sidearm gives me a nasty disadvantage with jamming prone rental gear. Here's a pic of the current gun, just in case anyone's thinking I'm trying to get around UKARA with a coloured gun lol. I wouldn't bother getting a kit for it, they're rare and go for good money to the right collectors. Looks to be in exceptional condition too. Yeah, you could get decent money for that! Fitting a metal kit would ruin it. I'm in the process of registering for UKARA currently but with the minimum wait time it'll be sometime in September before its all done, and all that time without a sidearm gives me a nasty disadvantage with jamming prone rental gear. Have a read around this subforum, its quite clear that the consensus (we're not lawyers) here, as far as manufacturing a RIF goes is that if you qualify for UKARA you have a defence even if you're not registered with UKARA - for a few reasons such as: laziness, objector to the retailer monopoly, under 18, play at different game sites, etc. Some people even subscribed to the one game philosophy, but i'd say, if you've played airsoft at least once between 12 and 2 months ago you don't need ukara to manufacture any RIF. As far as I am aware it is not an offence to 1/2=0.5 + 0.5 =1 - that is to say, if you start with a 1 RIF and make 1 RIF. How could anyone accuse you of manufacturing what you started with? It's not classed as manufacturing a RIF if you are already have a RIF, just as taking one of your (pre VCRA/RIFs you bought whilst previously covered by a defence) apart and reassembling it doesn't count as manufacturing. If you already own a RIF that you acquired legally, and replace/change every component on it, that's legal without a defence. If, however, you then used all the parts you replaced to build a second RIF without a defence, you would be in violation of the current laws, as you'd have a second RIF that you manufactured without a defence. Also, as has been mentioned, you don't have to be registered with Ukara specifically, you only need to prove your defence, i.e that you have played at least twice over no less than a 3 month period. Personally, I have never registered with Ukara, but I have been able to prove my defence via my local, regular site. Obviously, Ukara is a recognised, convenient way to prove your defence to purchase/build a RIF. It's very unlikely that anyone on here, I imagine, would find themselves in a situation where they had to provide a defence for manufacturing. In reality, there's nothing to stop you from purchasing all the required parts to build a RIF from scratch if you didn't buy it all from one place, curiously. Of course, for the record, I wouldn't condone such actions. Unlike my speculation, you're speaking in absolutes. Where's your source? Excluding the strikeout. Thanks for all the info guys. Definitely useful if I do decide to change the gun in future. One thing I didn't realise is that the gun is rare or worth a decent amount lol. I bought the thing around 10 years ago when it was relatively cheap online. Seeing as people are saying its a collectors item I think it might be a shame to alter it. Although it pains me to have to wait, I'll probably hang on until September when my UKARA membership will be validated and pick up a Full Metal M93R as I love a beretta and that 3 round burst looks amazing. I used to work for a large airsoft shop when the VCRA came in. The shop got a solicitor in to go through the ins and outs of the law regarding RIFs, she was very thorough and luckily I have a good memory for legalese. Edit - Have also worked with police in the past to help determine what is/isn't legal.